I’ve always wondered if there’s a tipping point at which the weather is so hot that people start saying no to baked goods. Just to give a little background, I train at a ballroom dance studio in Los Angeles that’s on the third floor of an old building with no air conditioning and inefficient windows that barely create a whisper of a cross breeze. So, when the weather heats up outside, it’s nearly unbearably stuffy and 10 degrees warmer inside the ballroom. I usually bring my most recent baked goods to share with my fellow ballroom dancers who are some of my most enthusiastic taste testers. Earlier today it hit 91 degrees on my terrace, so I’m going to put these Cinnamon Caramel Swirl Blondies to the test at the ballroom tonight and see if anyone tells me it’s just too hot to eat sweets. 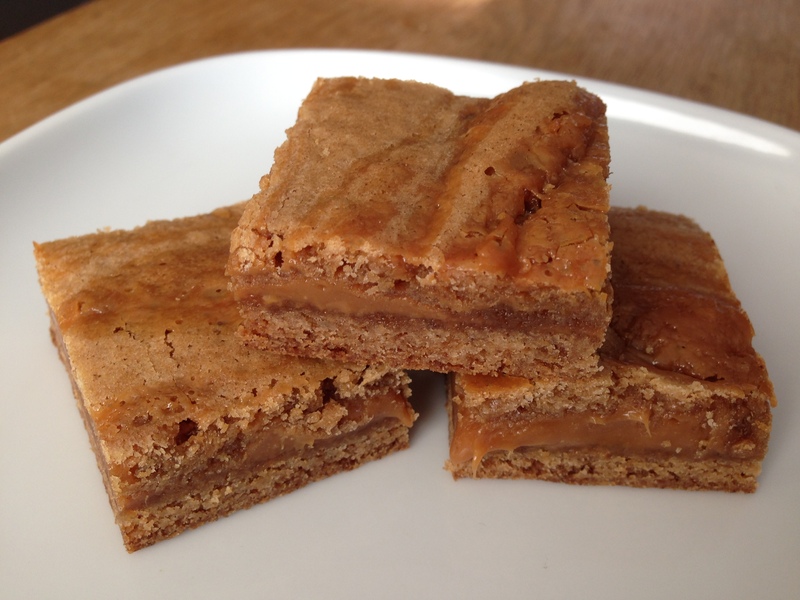 But passing on the blondies means they’ll be missing out on biting into soft and chewy, immensely gooey, cinnamon-y, caramely, slightly molasses-y bars of goodness. Line a 9×13-inch baking pan with parchment large enough so that the ends extend over the sides of the pan, and lightly grease. If you’re using aluminum foil, make sure to grease the foil very well as these bars get really sticky. Mix flour, baking powder, cinnamon, nutmeg, and salt in medium bowl. Set aside. Mix brown sugar, butter, eggs, and vanilla in large bowl until well blended. Add flour mixture, and mix well. Reserve 1 cup of the batter. Spread the remaining batter into greased foil-lined 9×13-inch baking pan (the batter will be quite firm, so using an offset spatula will make this a little easier). Bake for 15 minutes or until firm. Microwave caramels and milk in microwavable bowl on high for 2 to 3 minutes or until caramels are completely melted, stirring after every minute. Cool for 5 minutes or until the caramel is slightly thickened. Pour over baked layer in pan, spreading to within 1/2 inch of edges. You may not need to use all of the caramel mixture. Drop reserved 1 cup of batter by spoonfuls over caramel layer (Using a small cookie scoop makes this a little easier). Don’t worry if portions of the caramel layer peek through as the batter will spread during baking. Use a knife to swirl the caramel and batter to create a marble effect. Be careful not to cut through the bottom pre-baked layer. Bake for 15 to 20 minutes, or longer until the center is set. Remove the blondies from the pan using the handle of parchment/foil. Place on a cutting board, and cut into bars. A few years ago when I started expanding my baking repertoire beyond cookies, brownies, and cakes, I was always intimidated by making a cheesecake. 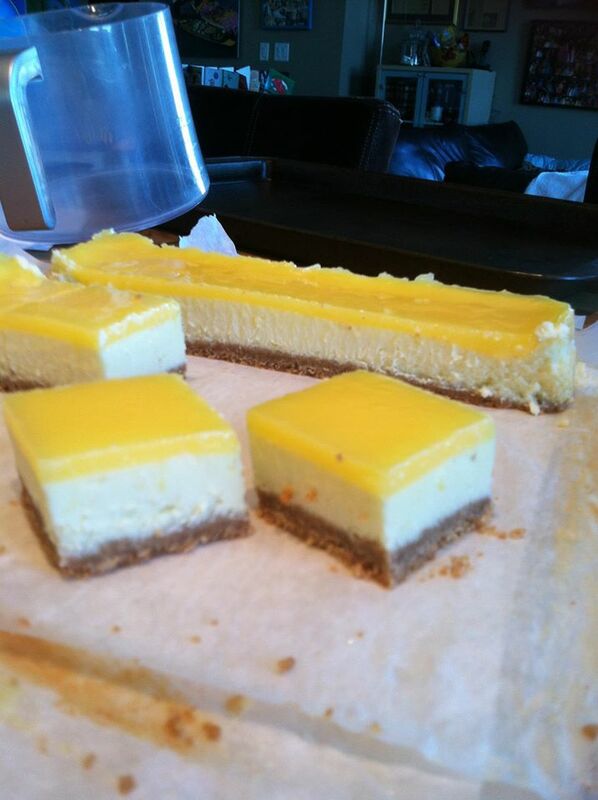 So, I eased myself into the world of cheesecake making by making Lemon Curd Cheesecake Squares. This recipe does not require the water bath often used for baking cheesecakes, and since it’s baked in an 8×8 pan, it’s easy to cut and serve neatly. Convenience aside, the rich and flavorful combination of the buttery honey graham cracker crust piled high with smooth, creamy cheesecake and topped with tart, bright lemon curd puts this recipe at the top of my must-bake list. Cut two 8×16-inch pieces of parchment. Put the strips in an 8×8 baking pan (preferably straight-sided) so that they cross each other and the excess hangs over the pan’s sides. Push the parchment into the bottom and corners of the pan. Break the graham crackers into a food processor, and process until finely ground. Add the melted butter, and pulse until the mixture resembles damp sand. Transfer the crumbs to the lined pan, and press them firmly and evenly into the pan. Set aside. Rinse, dry, and reassemble the food processor. In the cleaned bowl, combine the cream cheese, sugar, lemon juice, and lemon zest. Process until smooth, about 30 seconds, stopping halfway to scrape the sides of the bowl. Add the eggs, and process until the mixture is perfectly smooth and blended, stopping to scrape the sides of the bowl as necessary, about another 20 seconds. Pour the cheesecake mixture into the prepared pan. Bake until the sides are slightly puffed and the center is dry to the touch, about 40 minutes. While the cheesecake is baking, make the Lemon Curd for topping the squares. Set a fine strainer over a medium bowl. In another medium bowl, whisk the lemon juice, sugar, and eggs until thoroughly combined and most of the sugar has dissolved. Pour the lemon mixture into a small, nonreactive saucepan. Cook over medium heat, stirring frequently with a wooden spoon or heatproof spatula, until the curd is steaming (but not boiling) and thickened and registers about 175°F on an instant-read thermometer, 3 to 7 minutes. Don’t be alarmed if you see tiny egg clumps forming as you’ll strain those out later..
Take the curd off the heat, add the butter, and stir until the butter has melted. Pour the curd through the strainer to get rid of any lumps. Set aside, but use to top the cheesecake while still warm (it will be more difficult to spread on top of the cheesecake if it cools down too much). When the cheesecake comes out of the oven, pour all of the curd onto the cheesecake, and use an offset spatula to spread it evenly. 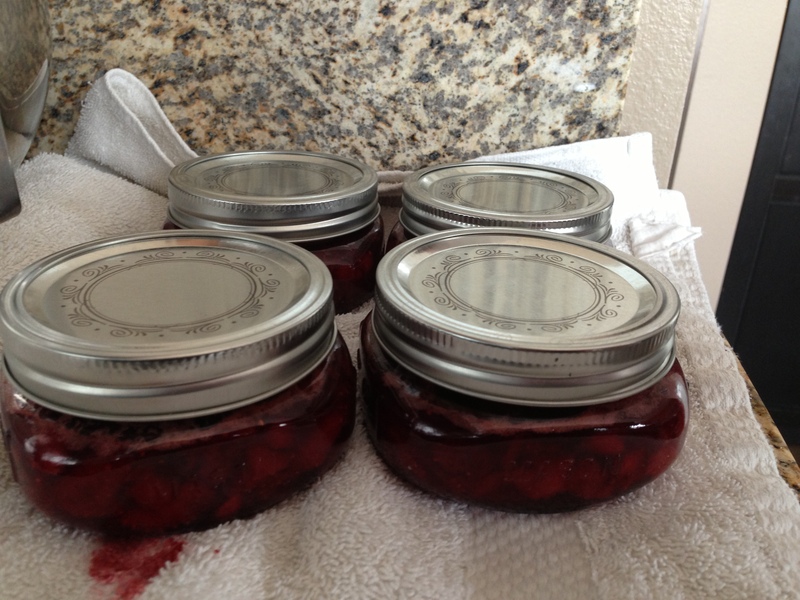 Let cool to room temperature, and refrigerate for at least 5 hours, preferably overnight. You can refrigerate it uncovered, as no detectable skin forms on the curd. When the cheesecake is thoroughly chilled, carefully lift it out of the pan using the parchment “handles” and onto a cutting board. Slide the parchment out and discard it. Using a large, sharp knife, cut the cheesecake into quarters, and then cut each quarter into four equal squares. To make clean cuts, wipe the knife blade with a damp paper towel between each slice. I like to put the squares in cupcake liners so that they’re easy to hand out and eat (no plate and fork needed for this cheesecake!). I’m slowly chipping away at the Nutella overstock in my pantry, and next up are these Nutella Stuffed Chocolate Chip Cookies. The cookies are thin and crispy on the far edges with increasing chewiness as you move toward the soft gooey, Nutella center. They’re utterly delicious and ridiculously addictive. BUT… and it’s a big but… they’re a bit high maintenance to make. They’re a little like the stereotype of LA – good looking on the outside, but a lot of time and effort goes into creating that image of looking effortlessly fabulous. This recipe is not a quick weeknight baking project as the cookie dough and Nutella need to be chilled. Also scooping the Nutella and wrapping it in cookie dough gets to be a bit messy. That said, if you’re willing to invest the time and effort, these cookies do live up to the hype. 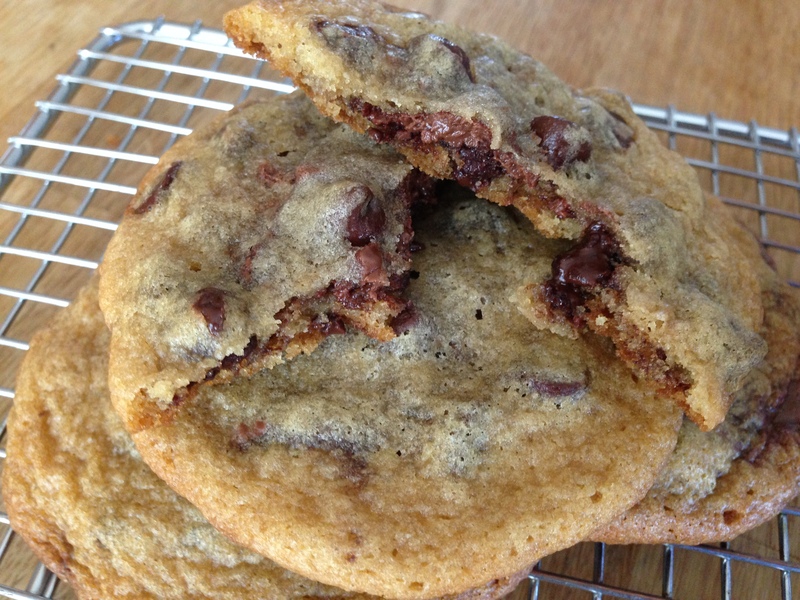 From the outside, these Nutella Stuffed Chocolate Chip Cookies look like any other basic chocolate chip cookie. But if you look closely at the center of the cookie, you’ll see a hint of the dark shadow of Nutella hiding just beneath the surface. The layer of Nutella in the middle of the cookie may not be that pronounced when you look at it, but you definitely get a blast of Nutella to your tastebuds when you bite into the center of the cookie. Place Nutella in the freezer. Mix together the softened butter, white sugar, and brown sugar in a large bowl until creamy. Add the eggs one at a time, mixing between each addition. Scrape down the bowl as needed. Gradually mix the dry ingredients into the sugar mixture. Measure 1 1/2 to 2 tablespoons of dough and flatten it onto your palm. 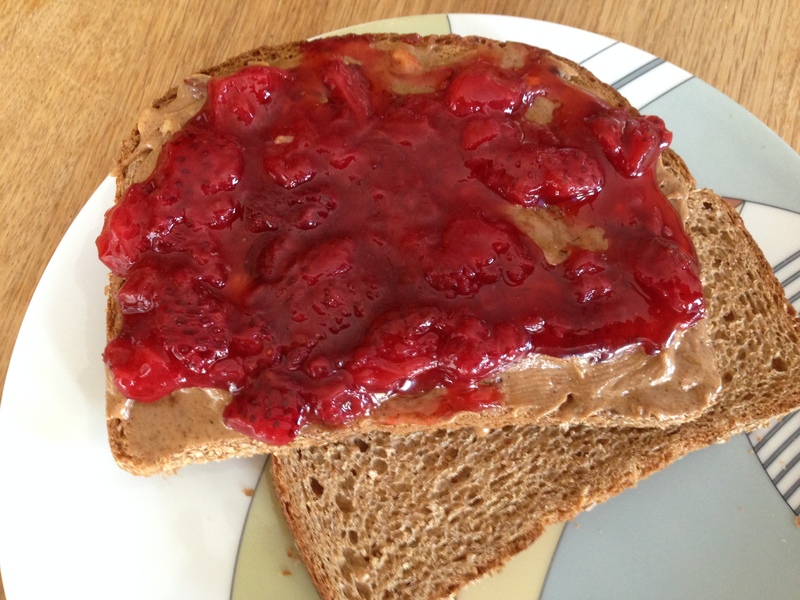 Put 1 teaspoon of Nutella in the middle (this works best when the Nutella has hardened a bit. Don’t try adding the Nutella when it’s still soft, as it will get all over the place and leak out the sides of the dough. Also, it’s helpful to use a small cookie scoop to do this so it doesn’t get so messy. ), and fold the cookie dough around it. Add dough as needed to make sure the Nutella is totally covered by dough. Place the cookie balls on a lined cookie sheet about 2 inches apart and slightly flatten the tops. Bake cookies for about 10 minutes until the edges start to turn golden brown. Don’t worry if the centers look pale as they’ll continue to cook as the cookies cool on the baking sheet. Cool on the cookie sheet for about 5 minutes before removing to a baking sheet to cool completely. If you feel like you’ve tasted all that caramels have to offer, then it’s time to try flavored caramels. These soft and chewy root beer honey caramels don’t take any extra effort to make, other than substituting the usual vanilla extract with root beer extract. The root beer flavor is smooth, creamy, and evokes the flavors of a root beer float. The directions specify NOT to scrape the bottom of the pan of cooked caramel. But, you can gather up all the remaining caramel on the sides and bottom of the pan and eat that off the spoon. Just make sure to cool the caramel a little so you don’t burn your tongue. Line an 8×8 ­inch baking pan (for thicker caramel pieces) or a 9×13 quarter sheet pan (for thinner caramel pieces) with parchment paper. Make sure the parchment goes up the sides of the pan. Don’t worry if the parchment lifts up from the pan a bit as the weight of the caramel will push it back down. In a small saucepan, heat the cream with the root beer extract (or vanilla extra, if you’re using that instead) over medium heat until it comes to a simmer. Reduce the heat to very low and keep the cream warm. Heat the sugar with the honey in a 4 ­quart or larger saucepan over medium/­high heat, stirring occasionally with a long­handled wooden spoon, until the sugar is mostly dissolved and it starts to boil, 4 to 8 minutes. Stop stirring and brush down the sides of the pot with a clean pastry brush dipped in water to dissolve any clinging sugar crystals. Clip a candy thermometer to the pot and let the mixture boil, without disturbing the bubbling sugar, until it reaches 305°F, about 5 minutes. Rinse any sugar residue off your spoon and dry it with a towel. Add the 3 tablespoons of butter and the salt. Slowly stir in the warm cream. Be careful as the mixture will boil furiously and bubble up considerably as soon as you begin adding the cream. The addition of the cream will cause the temperature of the mixture to drop. Continue stirring, watching the thermometer closely, until the temperature reaches 250°F (The honey makes these caramels especially soft, so even if you cook them to 250°F, they will eventually harden up a little but still remain soft). Take the pan off the heat. Immediately pour the hot caramel into the prepared pan. Do not scrape the pot. What sticks to the pot should stay in the pot. Set the pan on a rack to cool. Don’t disturb the pan until the caramel is fully cool and set, at least 5 hours, but preferably overnight. If you want to speed up the cooling/firming process, you can refrigerate the pan of caramel after it has cooled down a bit and is only slightly warm. 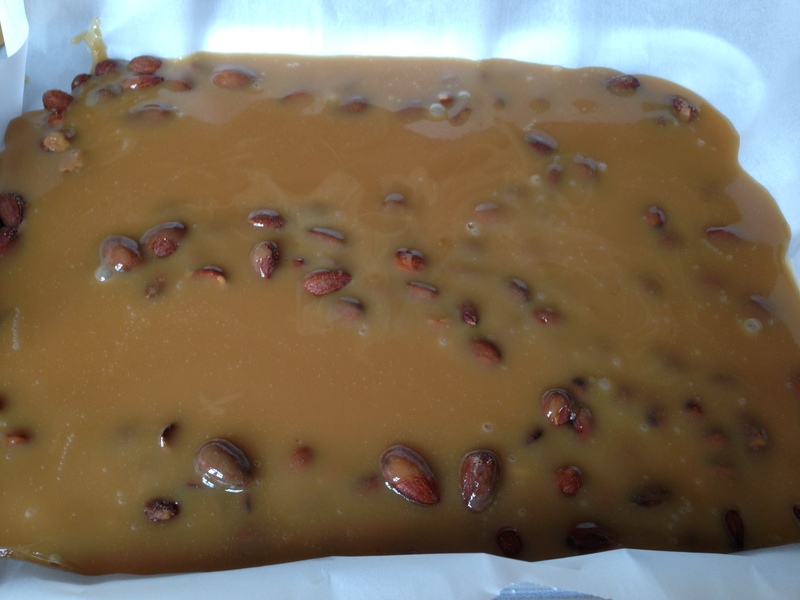 After the caramel has firmed up, remove the caramel from the pan while still on the parchment paper. With a heavy, large knife, cut the caramel into 1-inch squares, and wrap them in cellophane, parchment, or wax paper. Once cut, the caramels will slowly lose their shape, so it’s important to wrap them as soon as possible. 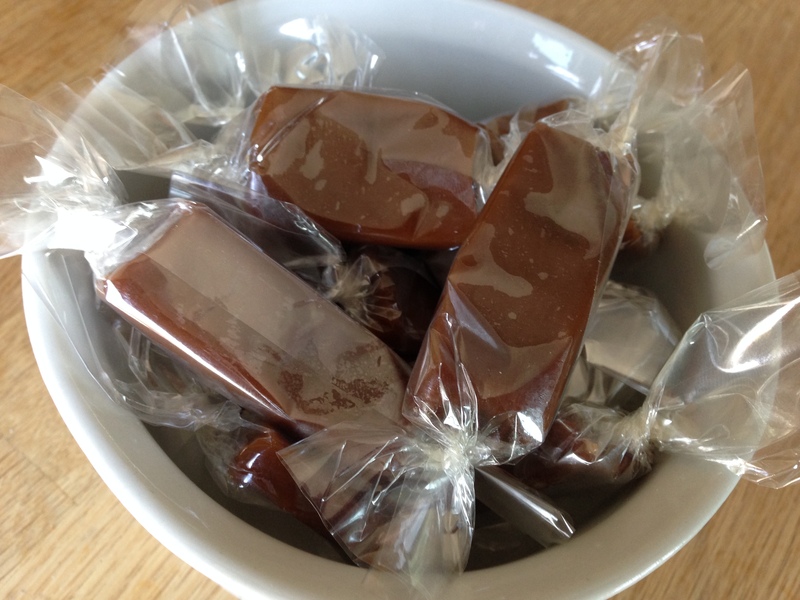 Note: The wrapped caramels will keep for about four weeks if stored in an airtight container at room temperature. I store mine in the refrigerator and they stay fresh even longer, although they often get eaten before then. Click here for more info on my favorite caramel making tools. Snickerdoodles are “fancy” sugar cookies, but they’re quick and easy to make. 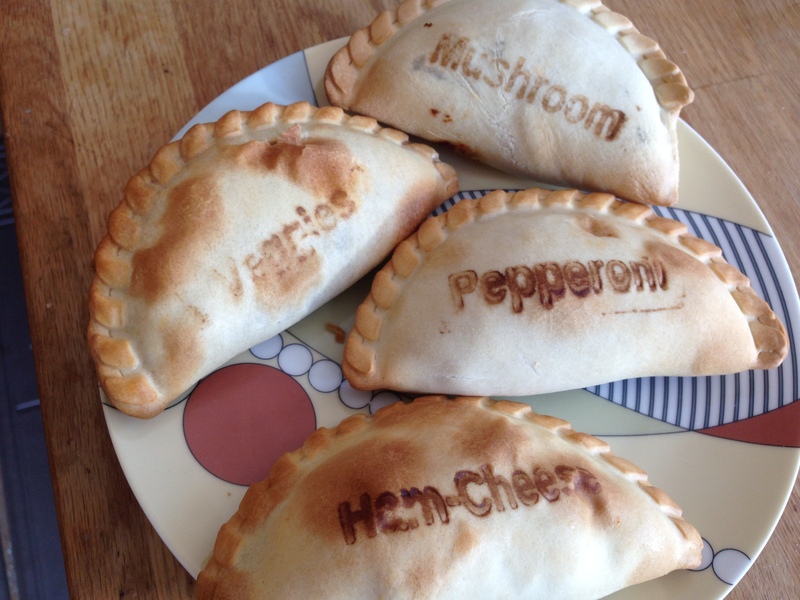 I whipped these up on a weeknight and still had time to catch up on several episodes Impractical Jokers. These cinnamon-sugar light and chewy cookies are the perfect TV-viewing snack. Preheat the oven to 400°F. Line (or lightly grease) two baking sheets with parchment paper. In a medium bowl, cream together the shortening and butter. Add the sugar and vanilla, beating until smooth. Add the eggs one at a time, beating until smooth, and stopping to scrape the bowl as needed. In a medium bowl, combine the flour, baking powder, and salt. Slowly add the flour mixture to the wet ingredients and mix well, scraping down the bowl as needed. To make the coating, mix the sugar and cinnamon together in a shallow bowl. Using a cookie scoop (a teaspoon cookie scoop) or spoon, scoop out 1 tablespoon of dough, and roll it into a ball. Place the dough ball into the bowl of cinnamon sugar. Gently coat the dough with the cinnamon sugar mixture. Put dough balls on the prepared cookie sheets, spacing them about and 1 1/2 inches apart. 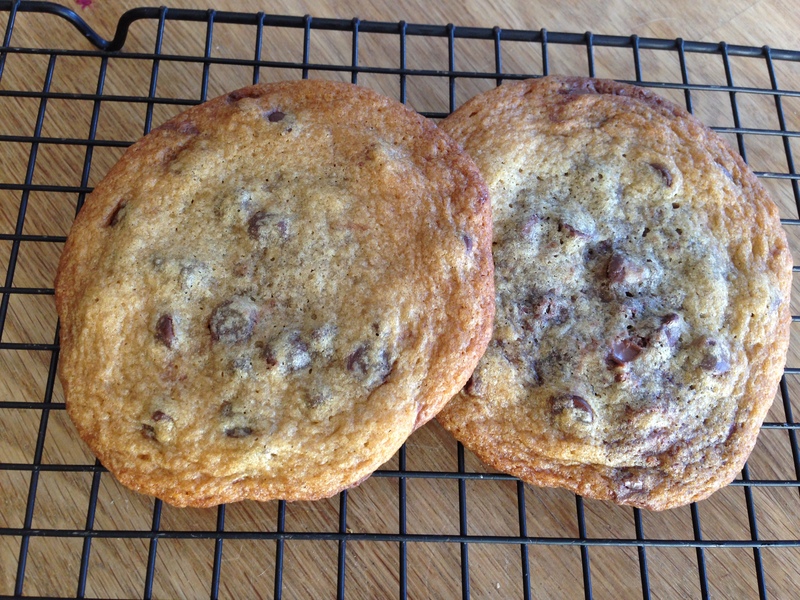 Using the bottom of a glass, flatten each cookie to about 1/2 inch thick. Bake the cookies for 8 minutes, or until they’re golden brown around the edges (Be careful not to overbake the cookies as the bottoms will darken a bit due to the cinnamon sugar coating.). Remove the cookies from the oven and transfer to a rack to cool. Ugh, in the past month or so, two friends have had their houses broken into and their possessions (many irreplaceable) stolen. There’s really not much to say to them other than to express my sympathy and send them a care package. Honey cream caramels with smoked almonds are not a substitution for lost family heirlooms and savings, but here’s to hoping that the caramels bring a smile to their faces. Line the bottom and sides of a 9-inch square baking pan (with straight sides) or a quarter sheet baking pan (9×13 inch) with parchment or foil, leaving a 1-inch overhang on two sides. If using foil, generously butter the bottom and sides of the foil. I typically use parchment and don’t need to butter it. Scatter the nuts (if using) evenly in the prepared baking pan. Set the pan aside. Put the sugar, honey, heavy cream, butter, and salt in a large heavy saucepan. Cook, stirring, over low heat until the sugar dissolves. Cover the pan, and increase the heat to medium. Cook, covered, for about 2 minutes to help dissolve sugar crystals that may have stuck to the sides of the pan. Uncover the pan, attach a candy thermometer, and boil without stirring until the mixture reaches 242°F. This took me about 10 minutes. Continue cooking the caramel until it reaches 250°F, carefully swirling/stirring the caramel in the pan over the heat to even out the color and prevent hot spots from forming. Make sure to check the temperature often as it can heat up quickly. Pour the caramel into the prepared baking pan without scraping the bottom or sides of the saucepan, as the mixture on the sides can cause your finished caramel to be grainy and hard. Put the baking dish on a wire rack and set aside, without stirring or jostling the pan until completely cool. Depending on how warm your kitchen is, this can take 3 to 4 hours or overnight. If I’m really impatient, I’ll wait until the pan has cooled a bit and then put the pan in the in the refrigerator to help speed up the cooling process. I do not put the hot pan directly into the refrigerator. 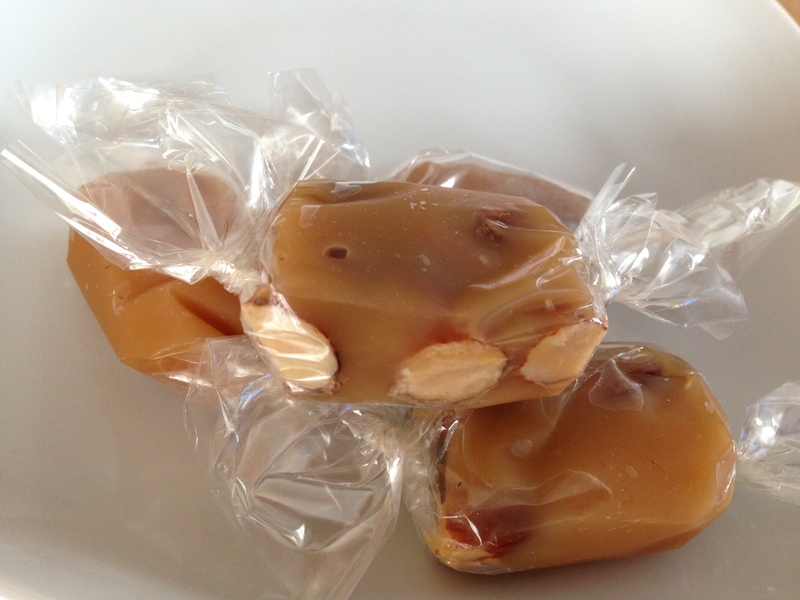 The original recipe provides the following directions for cutting caramels: “To cut and serve, use the foil handles to life the caramel from the pan. Carefully peel or tear away the foil and toss it out; put the caramel on a cutting board. If the caramel is sticking to the cutting board, spray the board with a little oil. Using a ruler as a guide (or by eye) and a long, sharp knife, cut crosswise into 9 equal strips and then cut each strip into 9 pieces. Serve immediately or wrap in small pieces of waxed paper or cellophane (2 3/4-inch squares).” My method for cutting caramels is slightly different. I use parchment to line my pan. So, after the caramel has set in the parchment (I tend to refrigerate the caramel to firm it up a little and make it slightly easier to cut), I pull out the parchment and place it on a cutting board. I cut the caramel directly on the parchment and peel the parchment off of the cut caramel squares. I butter my knife to cut the caramels, and I also rinse off the caramel residue from the knife quite often as I’m cutting. I tend to return the uncut caramel to the refrigerator to harden it as needed to make cutting easier. Ultimately, cutting caramels can be a sticky mess, so it’s a bit of trial and error to find the way that works best for you. I used to cut wrappers for my caramels from parchment and wax paper, but it was so mind-numbingly tedious that it tainted the caramel making process for me. Now I use pre-cut cellophane candy wrappers from caramelwrappers.com. They’re sturdy, non-stick, and look “professional”, and they’re reasonably priced. I make a lot of caramel, so I buy the 1000 pack. 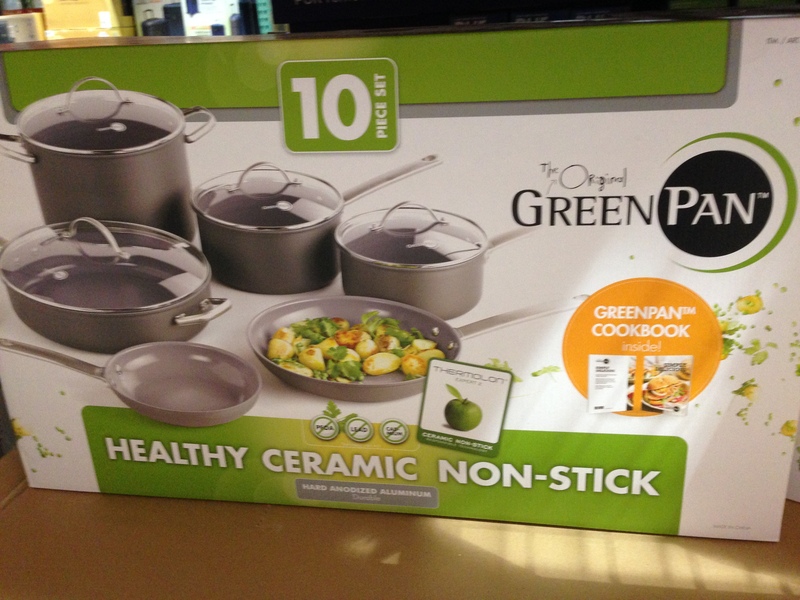 My favorite non-stick pan for candy/caramel making is this type of ceramic Green Pan from Calphalon. It heats evenly and even the stickiest substances slide right off which is perfect for caramel making. I noticed that Costco sells the set of pans, but I was able to find my pan at a kitchen outlet store. I prefer using parchment paper over aluminum foil because I often don’t have to take the extra step of buttering/greasing it. 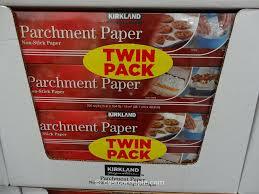 Parchment paper can be a bit pricey at the grocery store, but I buy it bulk (it comes in a 2 roll pack) from Costco which saves on costs. I have yet to find my favorite candy making thermometer. I haven’t had luck with accuracy of regular candy thermometers (and I find them kind of hard to read). I have a digital thermometer made by Epica which has a temperature range from -58 to +392°F (mine is similar to this one but an older model). It’s not a clip on though, so I have to hold it in the liquid to measure the temperature which is a bit high maintenance and tedious. But it has been very accurate in its temperature readings. I love Trader Joe’s Mesquite Smoked Almonds. They provide a unique smokiness and contrast to sweets such as caramels. Plus, I don’t have to take the additional step to toast them. I add them anytime I’m looking for an extra pop to my caramels or other desserts. 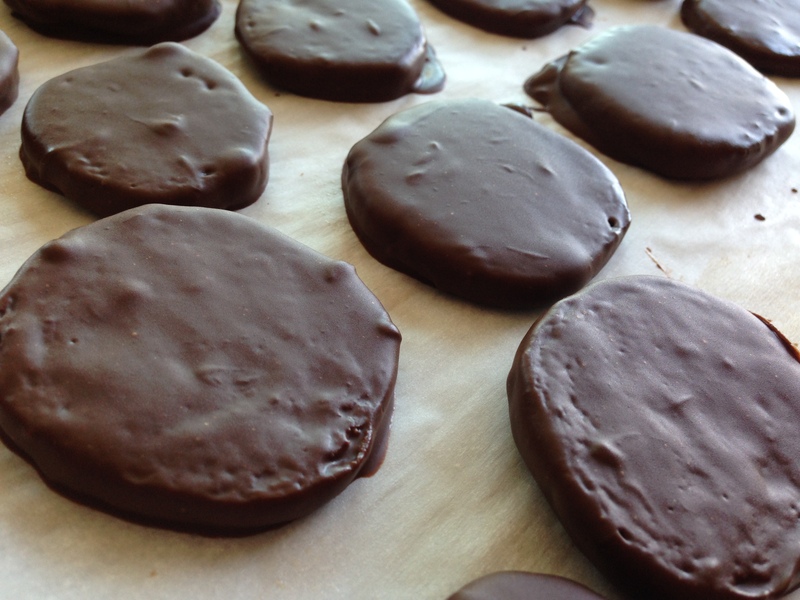 First up for TBT is a DIY Thin Mints recipes. One unfortunate side effect of moving from a suburban area to the middle of a developing urban, downtown area is that I no longer had visual reminders of Girl Scout cookie season. For the past three years, I kept missing my chance to buy Thin Mints during Girl Scout cookie season, but this year, I finally had a Girl Scout sighting and bought enough boxes to make up for all the lost years. During the previous years as I was experiencing my Thin Mints cookie drought, I eventually took matters in my own hands and decided to make a DIY version. The Girl Scouts’ version of Thin Mints (at least the kind sold in the Los Angeles area, although there has been talk about different versions of Thin Mints being sold) has a thin, crunchy, dry, and crumbly chocolate cookie covered in a thin layer of slightly waxy, minty chocolate. I found a variety of recipes online (even some involving Ritz crackers which puzzled me a bit), and after much research, decided that the recipe below would most closely resemble the original. Good news! No need anymore to carefully ration out your Thin Mints supply until the next Girl Scouts cookie season. You can just make your own Thin Mints. Beat butter and granulated sugar in a mixer bowl until smooth and creamy, about 3 minutes. Mix flour, confectioners’ sugar, cocoa powder, and salt in a bowl, then add it to butter mixture. Beat until well incorporated. Add peppermint and vanilla extracts. Scrape down the sides of bowl and mix again. Form the dough into two 12-inch logs (I wrap the dough in plastic wrap and then form it into logs while wrapped.). Make sure to pack the dough well to remove all air pockets in the dough. Refrigerate the dough logs for at least 1 hour (or long enough so that the dough logs will be firm enough to hold their shape when sliced) and up to 3 days. Slice the chilled logs of dough into 1/4-inch thick slices (don’t slice them too thin), and place the dough 1 inch apart on the cookie sheets. Bake until the cookies are just firm at the edges, approximately 12-14 minutes, rotating the cookie sheets on the oven racks halfway through the baking time. Cool the cookies on the cookie sheets for 3 minutes. Then transfer to wire racks to cool completely. Repeat with remaining dough on cool cookie sheets. Line cold cookie sheets with parchment/wax paper. Combine chocolate and shortening in small microwave-safe bowl. Microwave on high, stirring every 45-60 secs until the chocolate is melted and the mixture has the consistency of thick heavy cream. Using a fork, dip cooled cookies, one at a time, in the melted chocolate. Drain well and transfer to parchment/wax paper to firm up. Store the cookies in the refrigerator for up to 3 days or freeze them for up to 3 months. It’s not often that the story behind a chocolate cake recipe involves aspects of danger, anguish, turmoil, and eventually acceptance, forgiveness, and a sweet ending. A few years ago, I set out with great anticipation and optimism to bake this Chocolate Stout Cake, but disaster struck before I could even start. My treasured bottle of stout (it was a small batch, special brew with specific chocolate notes to it) that I had bought specifically for this recipe tumbled off my shelf, shattered on my concrete floor, and shards of glass ricocheted up toward my face. Luckily I pulled away quickly enough and managed to escape with only a slice above my lip. But as I sat in the emergency room waiting for the doctor to stitch up my lip, I vowed with a vengeance to forever shun this cake recipe. Years later the scar above my lip remains a constant reminder of that ill-fated day, but as with most things, the passage of time and a recent conversation with friends about the merits of Guinness beer convinced me to give this recipe another try. This time I made sure to store the bottle of beer more carefully. This cake is almost 4 inches tall. Here’s up close evidence of over indulgence. Preheat the oven to 350°F. Grease and flour two 9″ cake pans (make sure at least one of them is at least 2 inches deep as the batter rises while baking. ), and line them with parchment paper circles. Remove the pan from the heat, and whisk in the cocoa powder until the mixture is smooth. Set aside to cool to room temperature. In a large bowl, whisk together the flour, sugar, baking powder, and salt, and set aside. Add the stout-cocoa mixture, mixing to combine. (Make sure that the stout-cocoa mixture has cooled a bit so that it doesn’t scramble the egg-sour cream mixture). Add the flour mixture, and mix together at slow speed. Scrape the sides and bottom of the bowl, and mix again for one minute. The batter will be quite loose/liquidy. Divide the batter equally among the prepared pans (if your pans are the same size/depth). I filled my pans until they were about 3/4 filled. Bake the layers for approximately 35 minutes for the 9-inch pan with 1 inch deep sides and 50 minutes for the 9-inch pan with 2 inch deep sides. Ultimately judge the doneness of your layers by inserting a toothpick or cake tester into the center, and if it comes out clean, it’s ready. Remove the cakes from the oven and cool on a rack for 10 minutes before turning the cakes out of their pans and returning to the rack to finish cooling completely before frosting. Place the chopped chocolate in a large heatproof bowl. Bring the cream to a simmer in a heavy, medium-sized saucepan. Trim one cake layer to have a flat top, if necessary (otherwise the layer will crack when you place it upside down on your cake plate). Line the edges of a serving plate with parchment or waxed paper to keep it clean, and then place the layer upside down on top. Spread 1/3 of the icing over just the top of the layer. Use the remaining frosting to cover the top and sides of the cake. Remove the parchment paper.